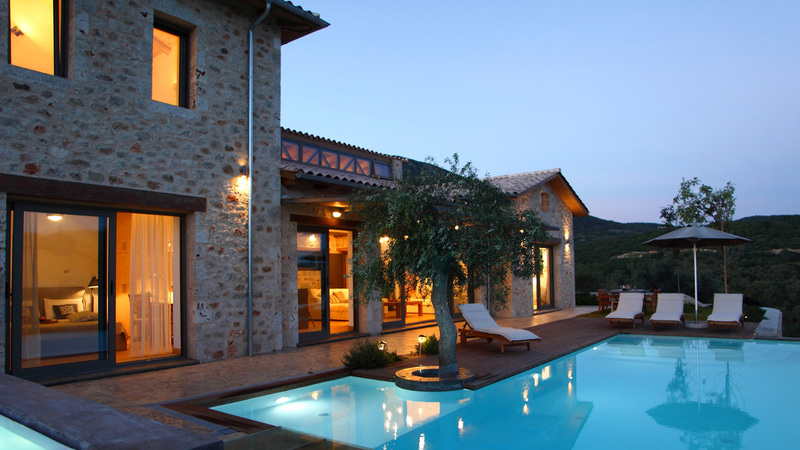 Casa di vino is a unique country house on the estate of the winery Lefkaditiki Gi in the center of Lefkada, between Nidri and Vasiliki. 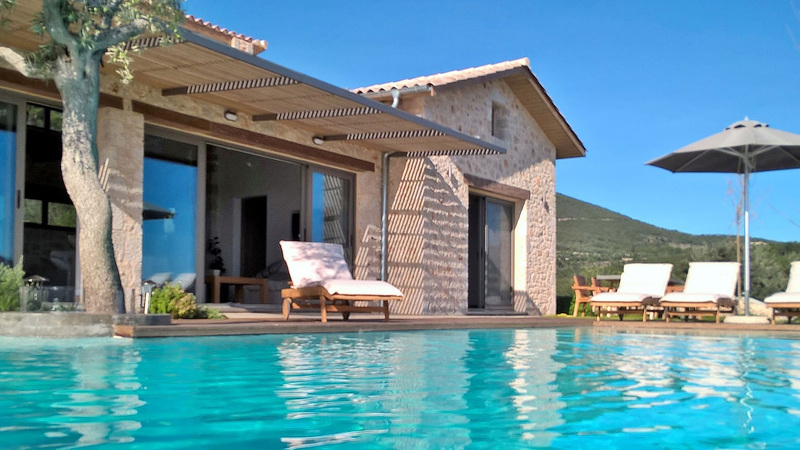 Located on a hilltop this holiday home offers panoramic views and is surrounded by the pristine beauty of Lefkada's rural landscape with pastures, olive groves and vineyards. The house couples the beauty of a traditional stone farmhouse with the best of modern design in the interior space to create a unique blend of old and new. Casa di vino covers 185 square meters and can accommodate 6 +2 people. It has 3 bedrooms, 4 bathrooms, a large living room and dining room, library, kitchen and outdoor dining area. The surrounding area includes an 8-person Jacuzzi, a large corner overflow pool and a wonderful garden with olives and herbs.Casa di vino is located on a hillside offering panoramic views of Lefkada's lush rural landscape and the Ionian Sea.To the north the rich vegetation of native plants, shrubs and trees. Wild carobs,lentisks, holm oaks and arbutuses blend with the cultivated land with olive trees in a vast painting in all shades of green. 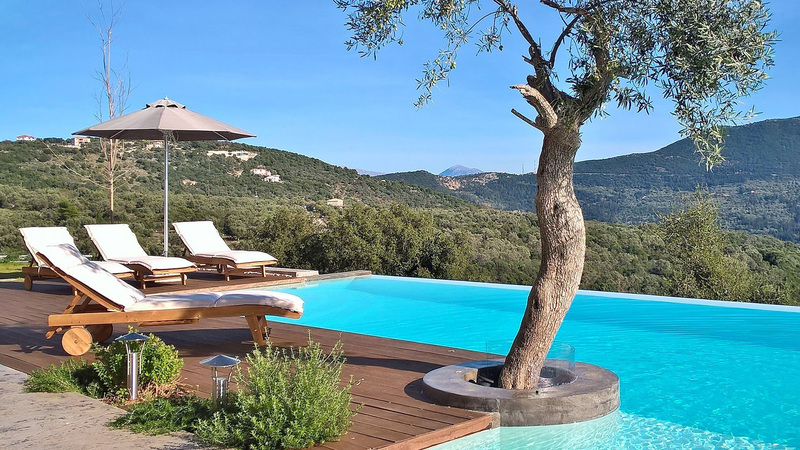 To the east of the house lie low hills covered with more cultivated fields and olive trees, while this symphony of green stretches to the deep blue waters of the Ionian Sea. The view to the south is unique, small green islands come into view on the horizon of the Ionian sea extending and defining the view of the endless sea. To the east of the house is the village of Poros with interesting traditional houses and to the south the traditional village of Sivota.The tranquility of the landscape is so calming to the eyes and the mind that it mesmerizes your soul. 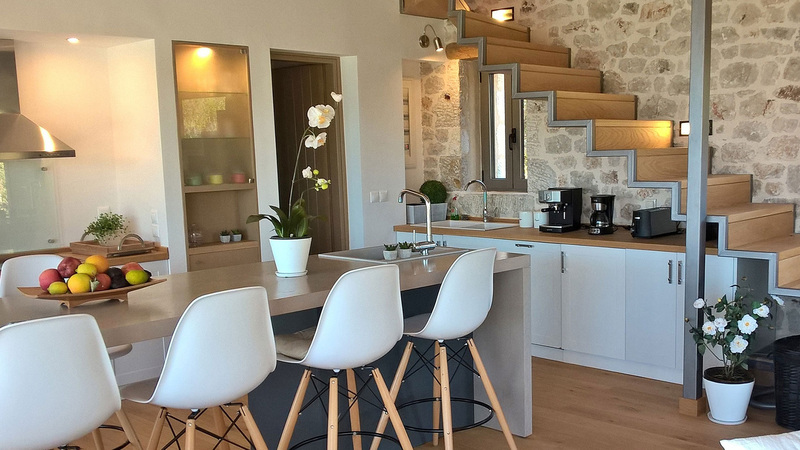 The location of the house is perfect and motivates you to explore the island.You are between the two most popular villages of the island, Nidri and Vasiliki. Nidri is only 10 km and Vasiliki 9 km. So in less than 10 minutes you can find many restaurants, cafes, wine bars, night clubs, wind surfing and other water sports,daily cruises, renting boats, a bank, shops, pharmacies, a health center and generally all amenities that will make your stay an unforgettable experience. Even closer at 4km you may find the famous picturesque fishing village of Sivota with its many good fish restaurants, as well as necessities (bakery and supermarket). The nearest beach is Mikros Gialos at 4.5 km (10 min), Amouso 8 km (15 min), Ponti, which is perfect for windsurfing at 9.5 km (15 min) and the beaches of Egremni and Porto Katsiki at 22 and 26 km respectively. 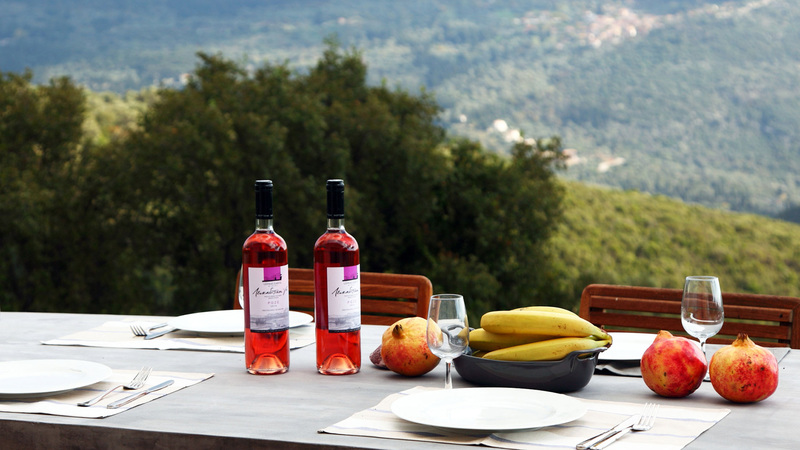 Το Casa di vino είναι διαθέσιμο σε εβδομαδιαία βάση. Οι ημερομηνίες άφιξης και αναχώρησης μπορούν να συμφωνηθούν με τους ιδιοκτήτες. Οι τιμές περιλαμβάνουν την αποκλειστική χρήση του σπιτιού συμπεριλαμβανομένης της πισίνας (ανοιχτή από το Σάββατο 2 Απριλιου μέχρι Σάββατο 29Οκτωβρίου). Η τιμή ενοικίασης περιλαμβάνει το νερό, ηλεκτρικό ρεύμα, Wi-Fi internet, κλινοσκεπάσματα, μπάνιο & πετσέτες, πετσέτες πισίνας, σαπούνια, και τα απορρυπαντικά. Περιλαμβάνει επίσης τον τελικό καθαρισμό,ένα καθαρισμό μεσοβδόμαδα, χρήση όλων των συσκευών και του εξοπλισμού. Δεχόμαστε πληρωμές σε πιστωτικές κάρτες, επιταγές και μεταφορές χρημάτων σε τραπεζικό λογαριασμό. Παρακαλείσθε να υποβάλετε την κράτησή σας και εμείς θα επικοινωνήσουμε μαζί σας! You can visit the winery driving to the south of the Island. It is situated in the 8th km of the Nydri-Vassiliki road, on your right just 500m after the cross road of Sivros. The distance is 24 km from the town of Lefkas, 8 km from Nydri and 12 km from Vassiliki.